At EXELTrain, giving our students the proper level of competency is at the heart of everything we do. We give them the tools, skills and confidence to make safety an easy process. As a Registered Training Organisation with over 11 years of experience in workplace training, we are experts at delivering Nationally Recognised courses across Victoria in an interactive and hands-on learning environment. Our unique learning structure ensures that all of our students are given professional support throughout their entire course, while also lasting long after the course is complete. We provide expert trainers, an enjoyable training experience and a range of support services that lasts a lifetime. We realise that you demand the highest level of quality in your workplace training, which is why our qualifications are nationally recognised. As well as this, EXELTrain is an accredited Registered Training Organisation, with courses meeting only the highest industry standard and expert trainers that are hand-picked. This way you’ll have the peace of mind knowing you’re given the most up-to-date training available by experienced professionals who understand the industry. Student support is something we take seriously. No matter what course you undertake, all students are offered lifetime technical support from our team of experts. Guaranteed. Our friendly and dependable customer service team is also on hand to provide any industry insight or extra information you might require, no matter how big or small. At the end of the day, our primary focus is simple – to make safety an easy process. After all, our student’s success is how we measure our success. We pride ourselves on our ability to provide an easier way to utilise the information you have learned from your course into real-life scenarios. 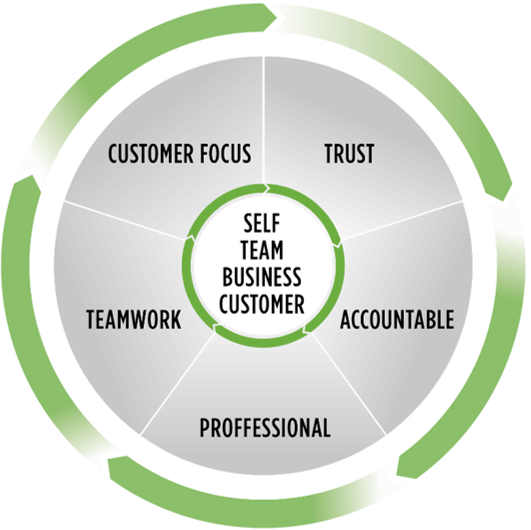 Customer Focus - we are focused on the customer, embracing new ideas that lead the way to better business.